The colors and patterns in this blow me away. I like the crows with their clean white lines, I like the central orangy bits, I like the blue purple flourishes. The mass of detail and elegant eighteenth-nineteenth century decorations repeated into a mandala goes right to the heart of mandalas … so much complexity that it becomes simplicity and eases the mind into contemplation. Love the color and pattern – I really like how the purple and blue circle around. And great subject matter, too! Another mandala! I’m really enjoying these, and I love the balance of cool and warm colors in this one. I saved your lesson on mandalas. I am hoping to get Elements for Christmas so I can do some of the neat digital stuff I see. 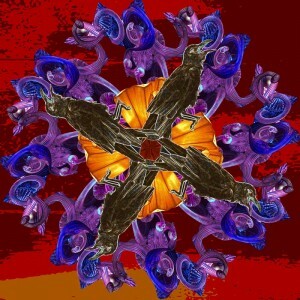 Your mandala is very Halloweenish – love it. My daughter makes costumes for her kids. She makes them nice enough to save as she wants them for her grandkids in the future too. I like fall but not for Halloween. I like it as a break from the heat of summer which I don’t do well with. When I lived in Illinois and Minnesota I enjoyed the changing leaf colors which I don’t get here in Arizona – the leaves just dry up and blow away in the ever present wind. Hope you feel better soon.